4th (of 8) 11-2-3 40" 1774 Pack & Chapman Never Recast 1920. Supplied weight given. 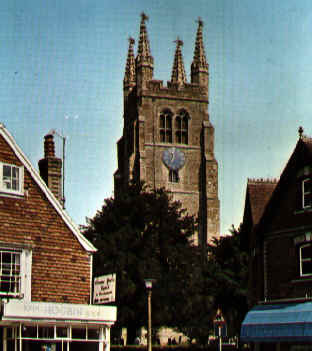 1461 Richard Herne of Canterbury bequeathed funds to build the tower. 1471 John Godday bequeaths £10 for a bell for the new bell tower. 1619 2nd recast by Joseph Hatch. 1621 Unspecified bell recast by Joseph Hatch. 1628 3rd recast by Joseph Hatch. 1636 3rd recast again, this time by John Wilnar. 1671 Unspecified bell recast by Christopher Hodson. 1709 Tenor broken by 5 "youths" striking it with hammers. 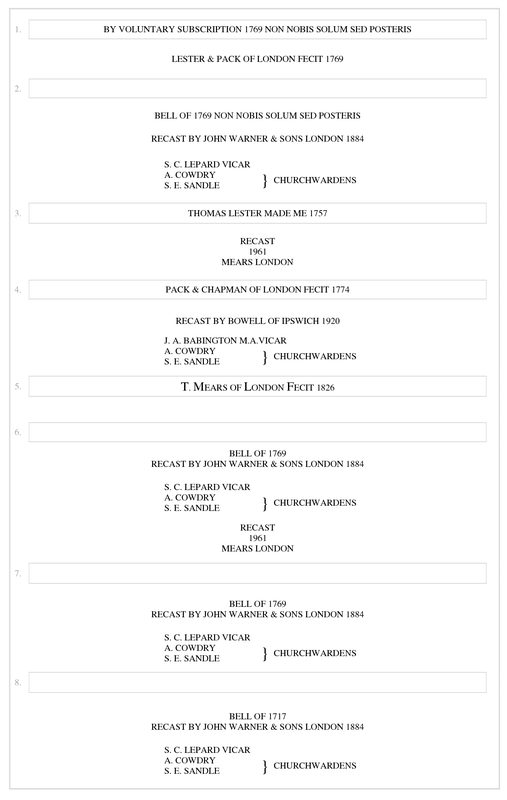 1717 Existing 5 bells recast into 6 by Richard Phelps. 1757 Treble & 4th (of 6) recast by Thomas Lester. 1769 2 treble bells added to make 8 by Lester & Pack. 1774 4th and 7th recast by Pack and Chapman. 1826 5th recast by Thomas Mears. 1884 Bells 2, 6, 7 and 8 recast by John Warner. 1912 The Archbishop of Canterbury (Lord Davidson) preached at a special service to mark the completion of the restoration of the tower. The tower is 100ft to the top of the parapet, and the pinnacles are 26ft high (with one 29ft high). 1938 A new clapper ball had to be supplied to the 7th, by Alfred Bowell. 1961 3rd and 6th recast by Mears & Stainbank and all the bells were retuned and rehung in the old frame. (Lack of funds meant that a new frame, which was advised, was not installed.) 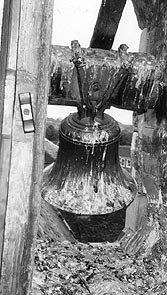 The bells were rededicated after the restoration. Sept was the start of something momentous. 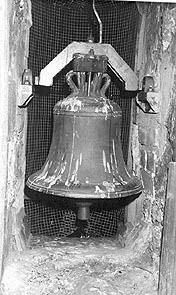 1971 Bells rehung in a new frame lower in the tower by Whitechapel. The previous frame used to be anticlockwise. They were rededicated by the Archbishop of Canterbury on 11th December. Sanctus bell prior to rehanging.